Boyce & McIntire. / 706 E 12 St. N Y. The partners were Daniel D. Boyce (1819/20-1898) and John Rogers McIntire (1818-1873). 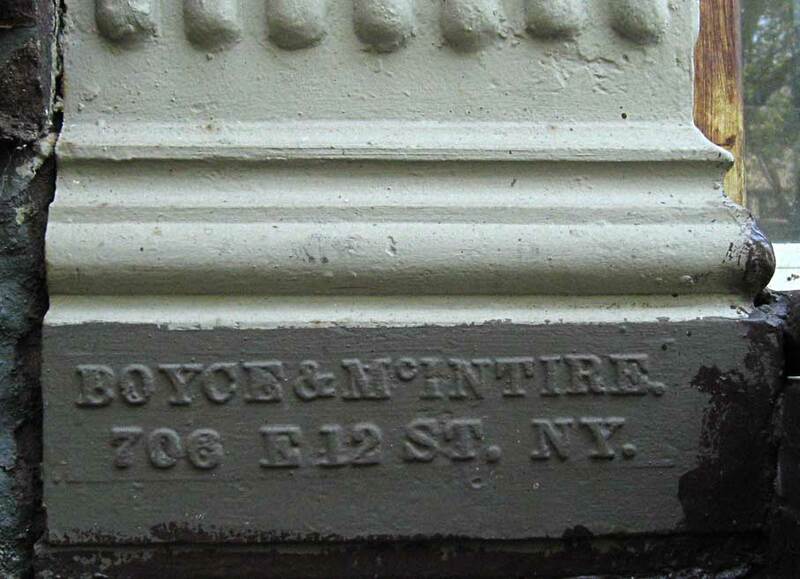 They were in business together as Boyce & McIntire from 1863 until McIntire's death in 1873. 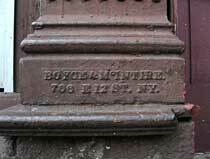 During this short period the foundry cast the iron for dozens of shop fronts that still exist in New York City. 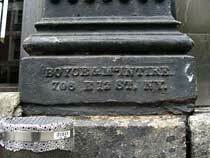 As of February, 2010, I have found no less than 31 Boyce & McIntire foundry marks in Manhattan and Brooklyn. 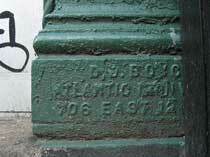 The foundry was called the Atlantic Foundry and was located at 706 E. 12th St. from 1868 to 1878. The business outlived McIntire for a few years, and for a short time was called Boyce and Fairfield (around 1878 when Boyce found a new partner). for Machine Castings, Loom Work, House Work, &c. &c., filled with dispatch. D. D. Boyce, J. R. McIntire. The 1870 U. S. Census (non-population schedules for manufacturers) recorded information about D. D. Boyce & J. R. McIntire, Atlantic Iron Works. The company owned capital of $50,000 and raw material valued at $35,650. These materials included 1000 tons of pig iron costing $33,000 and 300 tons of coal costing $2250. They employed an average of 27 men and 5 boys. Annual wages totaled $24,500. The value of the past year's production came to $75,500. 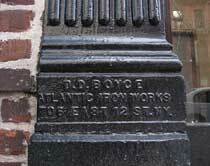 Another series of foundry marks are labeled D. D. Boyce / Atlantic Iron Works / 706 East 12 St. N. Y. 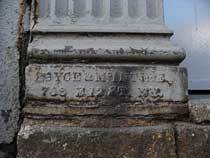 These marks date after the dissolution of Boyce & McIntire - i.e., after 1878 when Boyce continued on his own. 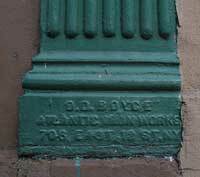 Daniel D. Boyce, Iron, was listed in New York city directories at 706 E. 12th St. from 1882 through 1892. 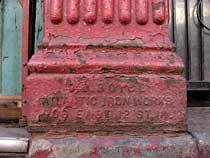 However, proprietors of the Atlantic Iron Works at this address from 1879 to 1888 were Burnet & Co. - i.e., James J. Burnet and his son, Gilbert J. Burnet. 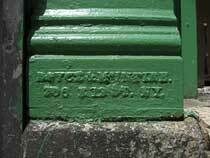 For more on the Burnets, see the Burnet, Jackson & Co. vault lights page.